The 'Doptone' produced by Smith Kline Instruments® in 1965, from technology developed at the University of Washington Cardiovascular Instrumentation Program. 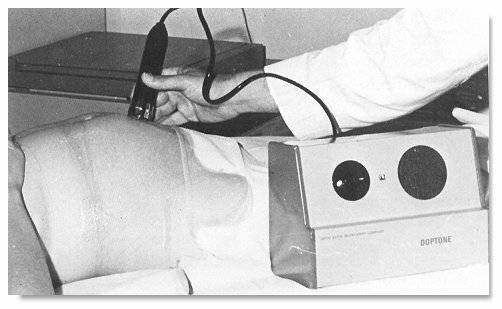 The Doptone, though looking as a trivial instrument now, was considered as one of the most important instruments that was invented in Obstetrics. Before that great difficulty was often present in detecting fetal life in both early and late gestations. It has quite considerably changed the practice of Obstetrics since the 1960s.